This program allows both great-circle (polar) and rectangular projections of the world. The great-circle map is centered on any specified latitude and longitude (the "home" location). 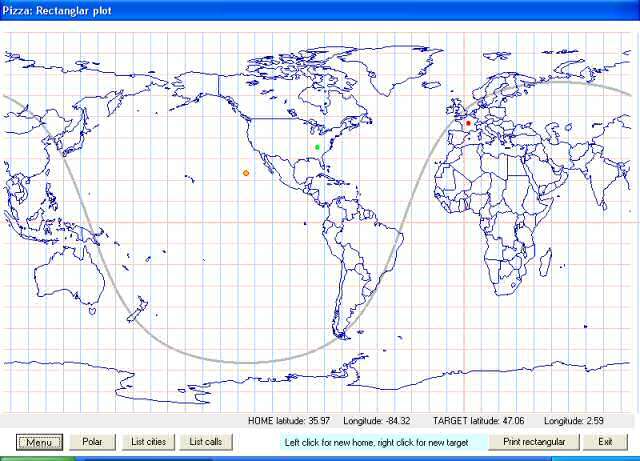 The rectangular projection is shown with the home longitude in the middle of the screen. The extensive database of cities and countries was upgraded by Vince Grgic, S52CC, and thanks are extended to him for his considerable effort! If you have modified that database yourself, be sure to archive it and add your changes to Vince's version. Better yet, tell either of us about any changes so they may be incorporated into the program. The home location can be specified by either a direct entry into a textbox or by using a pulldown list of over 3200 sites around the world. Similarly, a target location can be specified directly, by using another pulldown list or by entry of the Maidenhead grid data into a textbox. The home and/or target locations may also be entered by selecting the rectangular projection and left-clicking on a location to instantly specify a home location, or right-clicking on a location to instantly specify a new target location. The target location may be entered on either the polar or rectangular projection by clicking on List Calls and then selecting a prefix. The current sun location along with the terminator are (optionally) shown on both projections. An Offset input allows correction for daylight savings or half-hour time zone correction. The path from the home location to the target location is shown on both the polar plot and the rectangular plot. Text data files for an antenna pattern can be overlaid onto both the polar and the rectangular plots; pattern size is adjustable. "Rings" showing gain referred to the azimuth of maximum transmission and 3, 6 and 12 dB below that point can be toggled on and off. The size of the plot in terms of kilometers can be stepped by pressing the "Closer" or "Farther" buttons. A compass with lines at 10 degree intervals can be overlaid on the display. This can be toggled on and off using the "Compass" button. A set of rings showing distance in 1000 km intervals can be overlaid on the display. This too can be toggled, by using the "Distance" button. The resolution of the on-screen plots can be adjusted over a wide range. This allows quick screen update even on a slow computer, or higher-quality presentations at the expense of an increase in plotting time. The output from the printer is always at the highest resolution. The output to the printer is from a separate routine which closely duplicates the output as seen on the screen, but of course without pixelation. To send a plot (polar or rectangular) to the default printer just press the "Print" button. If the home location is within the contiguous United States, and if the size is set so that the map covers mostly those states, then the map shows the state boundaries as well. On exiting the program the current parameters are stored for an easy restart. The plotting routines really need a fast computer. Using a fast computer allows good screen resolution within a reasonable time frame. Slow computers take longer to re-plot the screen for a given resolution. Plotting resolution is adjustable over a wide range.